Highlander Golf course living at its finest! SAGE HOMES custom built 2 story home in the desirable Highlander Estates gated community. 4 bedroom craftsmen style home boasts a beautiful cooks kitchen fit for a chef! Kitchen offers an enormous island along with ample room for 6 bar-stools & stainless appliances. Quartz counter-tops open to the living room for an entertaining atmosphere. Engineered wood flooring span the entire main floor, opening to a tiled electric fireplace in the living room. Spacious master suite with a dual vanity & beautifully tiled shower w/walk-in closet. 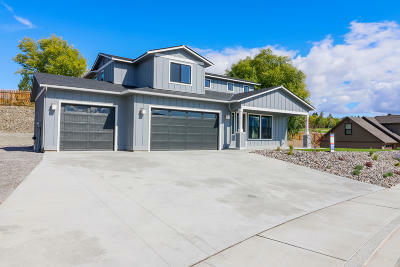 Three car garage nestled on large irrigated 1/2 acre lot. Sit out on your covered front porch and soak in the Columbia River, golf course and valley views.